Livelihood through farming – 21 dependents. 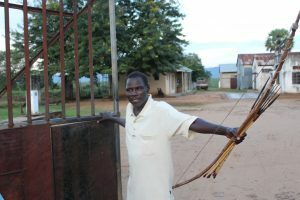 East of Arua district in Rhino camp sub-county, you find Mr. Shaban Juma a soft spoken 42 years old man. Juma is married to three wives and has 18 children. Three of the children have married and started their own families while eight (8) are still in school. About two years ago, Juma was worried about how he could feed his family. His major source of income was fishing which was mainly done in the night and then would go to the gardens on returning home from fishing early in the mornings. This let him with little time to rest and he was fatigued. With this high level of work and his large family, he still couldn’t meet the family’s basic needs of food and bedding. Not only mouths to feed, Juma also had a significant school fees and material bills to settle each term. Living in an isolated area, the major challenge they had was to get market for their small volume of maize, cassava and sesame of crops that they were growing. The major crops they grew were maize, cassava and simsim on a very small scale. The area was formally a cotton growing area when the ginnery was active but when it shut down its operations, the community lost interest in growing cotton because there wasn’t a ready market for their cotton. At the beginning of the year 2016, the Rhino Camp Ginnery was reopened with the arrival of GADC. This brought back joy to the local communities as they were excited they were going to get market for their crops. However, some community members weren’t sure whether GADC would fully pick up the operations. Juma was among the few farmers that were excited and decided to start growing cotton as he had a lot of pressure form looking after his large family. He only planted cotton on one acre and was very excited about how much money he had earned from the venture even with the poor agronomic practices that he was carrying out. Juma is even excited as GADC is currently identifying farmers that they will work with and train on the best agronomic practices to improve on their production and yield and he has already been selected. GADC also created employment opportunities for the community around as it wanted workers in the ginnery. Juma applied for a job as a security guard and he got the job and this has boosted on his income. Juma believes that when he actively participates in the project that GADC is bringing to them, he hopes that this will bring a transformation to his livelihood and he will be able to take his school going children to good schools and also hopes that one day he will build a good house for himself. ‘Tis the season: Business begins.